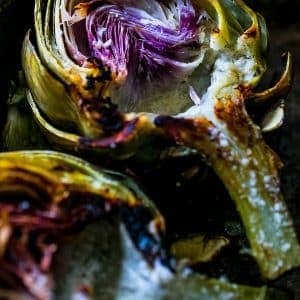 Deliciously easy SteakHouse Style Garlic Butter Charred Artichokes are the most delicious way to make steak house style artichokes ever! Perfect for parties- no butter dipping needed! In Denver, our obsession with everything Elway is apparent to just about anyone. He’s not just the famed number 7 on the field – John Elway has his name on tons of things all over Colorado, but my favorite (off the field) is his steakhouse in Cherry Creek, Vail, and downtown. I love steak, and theirs is fantastic, but anytime I’m at Elways, I LOVE their grilled artichoke. 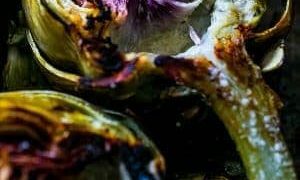 Their artichokes are smoky, salty, and PACKED with garlic butter flavor – because they are cooked and then charred with garlic butter poured right into the artichoke as it cooks again. 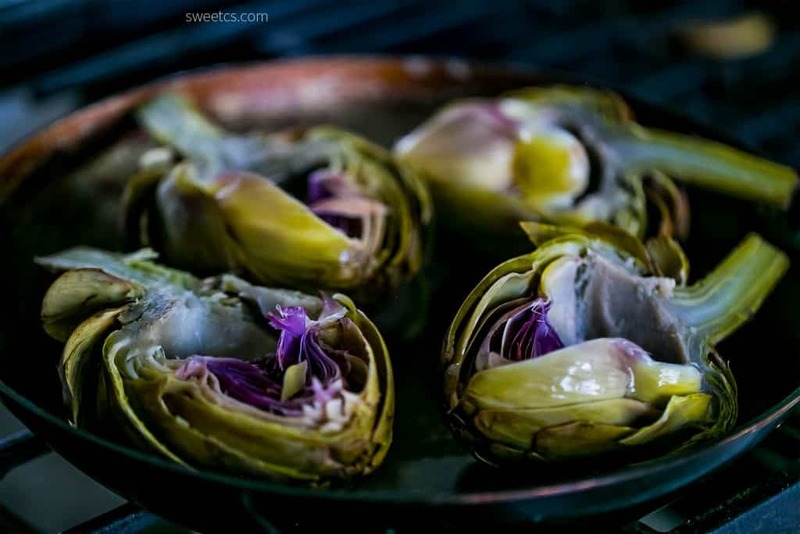 This gives the artichokes a delicious meaty grilled quality you can’t get without the second cooking – and is something you have to taste to believe! Luckily, with this garlic butter charred artichoke recipe you don’t have to resort to licking the plate – you can whip them up anytime because they are pretty simple! These artichokes are so delicious, you want to lick the plate when you’re done. 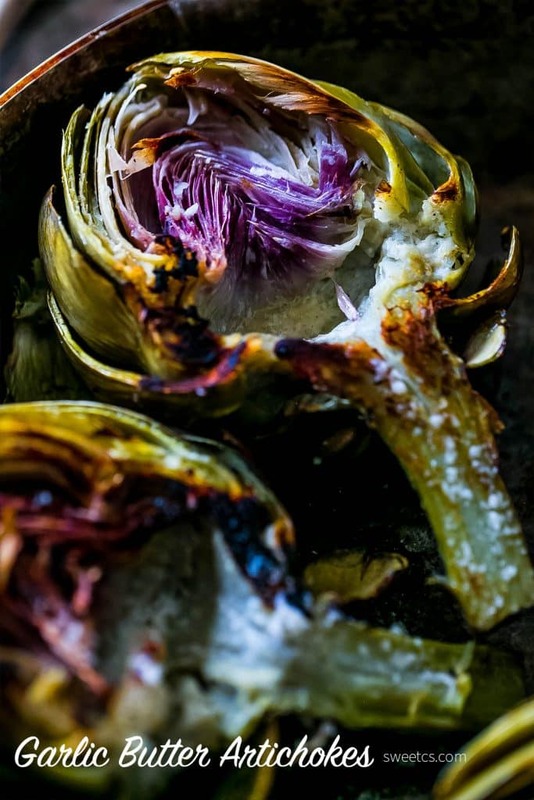 One of my absolute favorite things to grill is vegetables, oddly enough- and these Charred Garlic Butter Artichokes are PERFECT on the grill (or in the pan if it’s cloudy!!!). The artichokes are also perfect for dreamy dinner parties – because they are so easy to eat since you don’t need to dip them in tons of butter – as it’s already drizzled all over the artichokes! One of the reasons these artichokes are perfect for entertaining – they have butter cooked right into them, so you don’t have to worry about melted butter dipping stations for guests! I know what you’re thinking- dipping in the butter makes it sooooo delicious – but trust me, from one butter-holic to another, you will seriously not need any, because we’re going to drizzle it into all of the nooks and crannies of the vegetable, and let that butter sink in and get lovely golden brown and full of garlic flavors. These artichokes really are that good! And this recipe is perfect for entertaining- simply pre-boil the artichokes and halve them, removing the “choke” hairs, and then refrigerate for up to two days before your party. When you’re about ready to eat, pop them in a pan, and add the garlic butter. 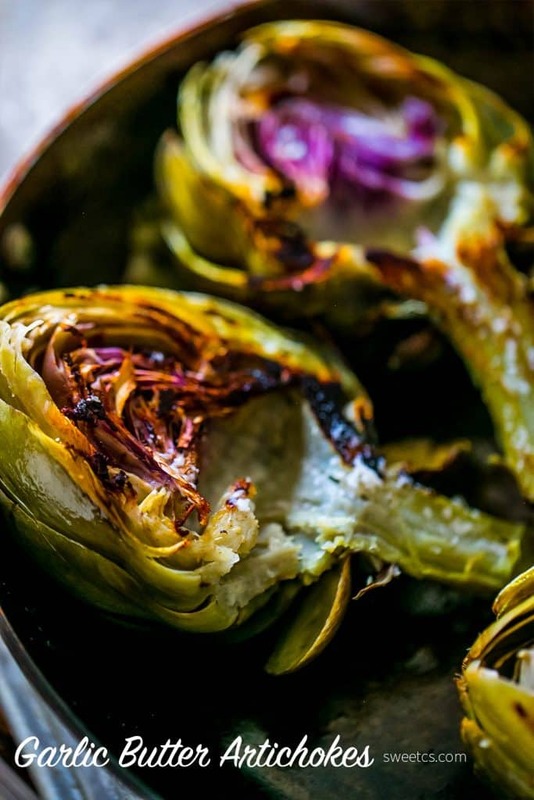 No slaving over a boiling pot or worrying about cooking the artichokes to be soft enough- charring takes under 10 minutes, so these are a perfect last-minute party dish! Please click to preview the food video (for the ones that have them) and then the link or the picture to see each post below! Deliciously easy Garlic Butter Charred Artichokes are the most delicious way to make artichokes ever! Perfect for parties- no butter dipping needed! In a small pot, melt butter, one part olive oil, and combine garlic powder and salt. Heat a large heavy pan on medium high heat (or prepare a well-cleaned grill). 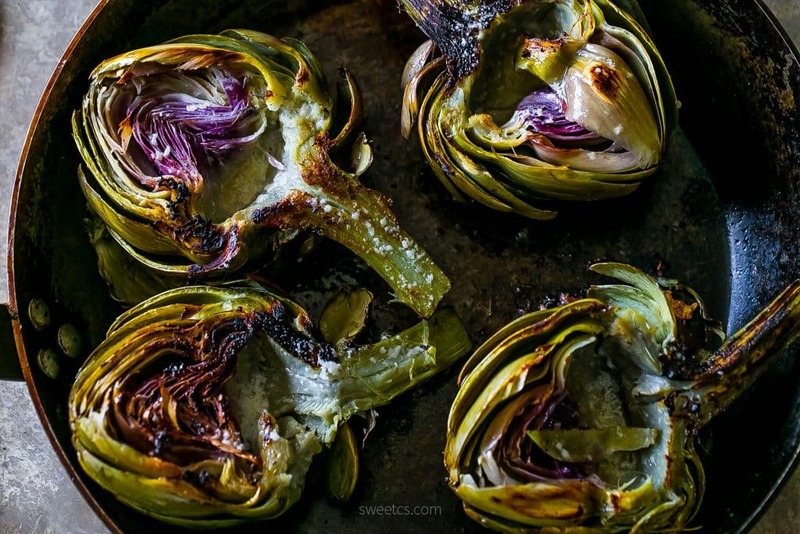 Drizzle butter mixture into artichokes and swirl around, letting it sink into artichoke meat. Add other half of oil to pan and heat until shimmery. Add artichokes, face up, to pan and cook until the backs are browned- about 5 minutes. Flip artichokes over and let them char another 5 minutes, face side down. If desired, add a little fresh grated parmesan to artichoke meat. 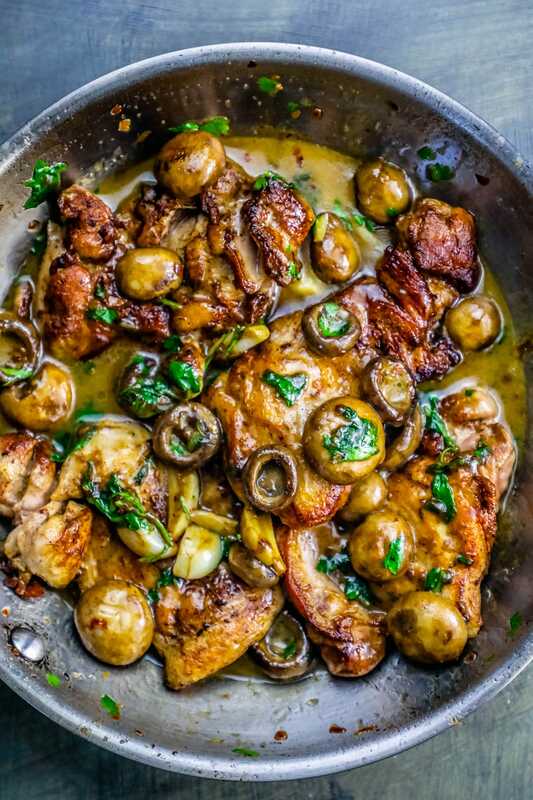 If you love this recipe as much as I do, please sign up for my FREE newsletter – which comes straight to your inbox every day there is a new recipe or travel post! It’s not spammy, and only full of my favorite ideas! Beautiful photos! Definitely inspired me to make the recipe, it was DE-LIC-IOUS!! Thanks for sharing!